A familiar sight - traffic backed up on Route 6. Whether you live on Cape Cod year-round or visit during summer, Route 6 is a part of daily life. Most of us use it to get pretty much anywhere of any distance on this small peninsula. It’s so baked into the DNA of the place that it’s hard to imagine a time before summer traffic jams, before the familiar artery we so heavily rely on today. The ancestors of Route 6 were the rudimentary roadways and cartpaths that already existed in the region when the Pilgrims arrived. 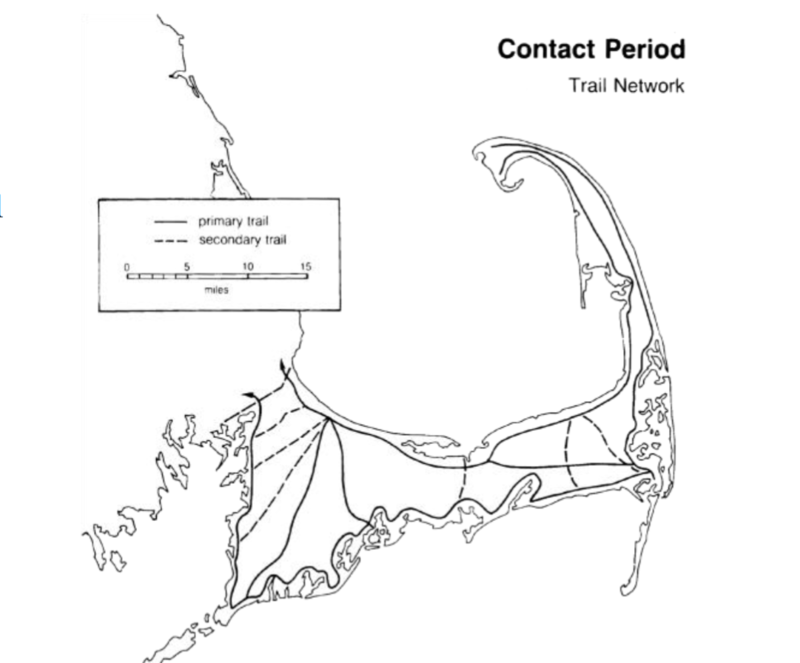 This image shows the network of trails that existed on Cape Cod prior to the arrival of the Pilgrims in 1620. 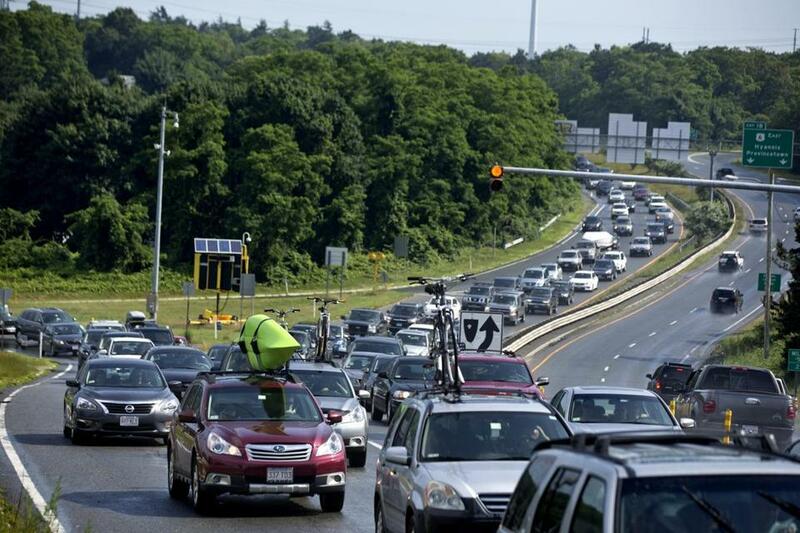 “Many of the roads we see on the Cape date back even before the Pilgrims,” said Steve Tupper, Transportation Program Manager at the Cape Cod Commission. As the maritime industry began to grow, roads were expanded and improved to provide access to the region’s many harbors. Then came the railroads, which eventually reached nearly every town on the Cape. The road was officially designated in 1926, nine years before the canal bridges were built. “At that time, it was really just a designation that followed many local routes. So for the most part, on the Cape, it would be following what we know today as Route 6-A…so it provided that long connection, but it doesn’t have the infrastructure that we’re familiar with today,” Tupper said. 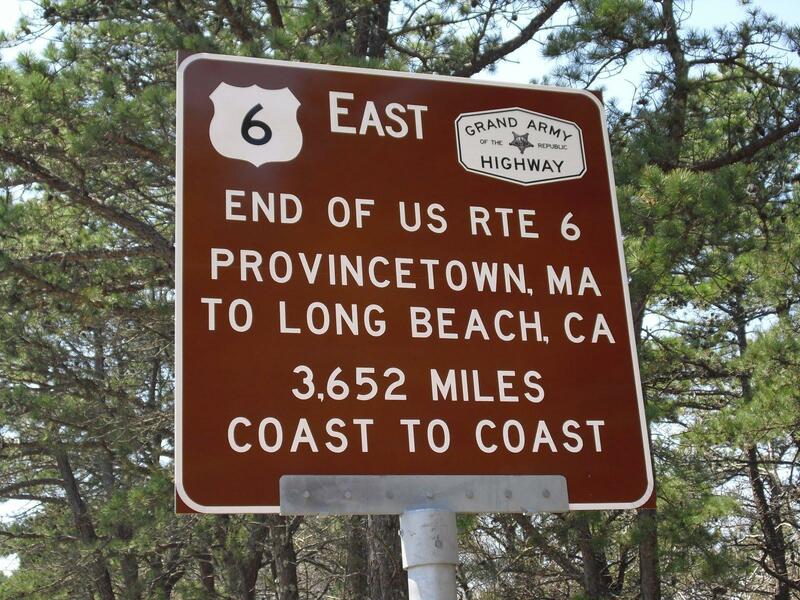 The next milestone for Route 6 was in 1937, when it was expanded to become a trans-continental highway connecting Provincetown to Long Beach, California. The coast-to-coast roadway became the longest numbered route in the U-S, a distinction it held until 1964. Route 6 is part of a coast-to-coast highway that was the longest numbered roadway in the country until 1964. Fast-forward 13 years, when the first major expansion of Route 6 got underway. That effort was tied to the Eisenhower administration’s initiative to develop the first U-S interstate highway system. “1950 was the first major construction effort that brought Route 6 from the Sagamore Bridge up to Hyannis just as two lanes and ending at what was known as the Hyannis Rotary, which is where we would know the exit 6 interchange today,” said Tupper. In 1952, the 2-lane road was extended to Dennis at what’s now exit 9. Then, in 1959, it was lengthened to reach the Orleans-Eastham rotary. The main part of Route 6 goes right through the middle of the Cape, an area where there wasn’t much development when the highway was cut through. Consequently, there wasn’t a lot of local opposition to the new road. The highway went from 2 to 4 lanes in 1954, but only as far as exit 6. It would be 1971 before those 4 lanes would continue to Dennis. In the 1980’s, there was an effort to try and widen Route 6 to 4 lanes from Dennis to the Orleans rotary, but local opposition and resource concerns prevented that from happening. Meanwhile, one of the biggest challenges today is keeping the busy highway safe, especially in communities like Eastham where Route 6 also serves as the town’s Main Street. This piece first aired in June, 2018.